There are many career paths for a commercial pilot. The highest demand for pilots is with the airlines. Airlines face one of the most severe pilot shortages ever. In fact, thousands of civilian pilots are needed in the next few years to meet the airlines’ demands for pilots. The industry is looking for people like you that can become successful commercial pilots. You don’t need to graduate from a university aviation program to be an airline pilot. In today’s job market, men and women from all educational and professional backgrounds are embarking on Commercial Pilot Training and discovering the fulfillment of doing something they’ve always wanted to do: FLY. The Genesis program starts you from the very first flight using the advanced equipment found on today’s airlines. Our Diamond DA40’s are modern all composite airframes with glass cockpits that are designed for the 21st century. We believe our commerical pilot students need to fly the same technology used by the airlines they will be working for. Major airlines are not flying planes built in the last century and neither does Genesis. The consistency of the G1000 flight deck from single engine to multi-engine and simulator allow you to graduate with expert-level proficiency using advanced flight managements systems. Management and staff include Seneca graduates, Brampton graduates, Diamond Flight Centre graduates, military fighter pilots, and many other backgrounds. We have methodically compiled the best material from our collective experience to develop a detailed syllabus for each module. Genesis Flight College is a relatively small private college and the environment is highly collaborative and social. You will get to know many of your fellow students and enjoy an open-door policy with the entire staff. We measure our success by your personal success, and we take that seriously. We value dedication and commitment from our students, and nurture a culture of exploring the business of aviation beyond the textbooks. This commitment to providing a broader experience gives our graduates a further competitive edge when they enter the workforce. Enroll in Our Flight College Program Today! At Genesis Flight College, we are excited to announce that the Ministry of Training, Colleges and Universities has approved us to open a new private career college in Collingwood. Is aviation your passion to the point where you want to make it your career? If so, at Genesis Flight College, we can help you get there. At Genesis Flight College, we offer commercial pilot training to residents of Collingwood, Toronto, Barrie, Aurora, Brampton, Caledon, Markham, Newmarket, Richmond Hill, and Vaughn, Ontario. WHAT IS A GLASS COCKPIT? 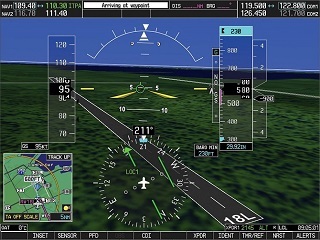 With rectangular computer displays replacing the familiar round flight instruments, and data presentation that differs considerably from the analog format, it’s no surprise that new airline crews feel lost, even uncomfortable, flying glass. This issue has been identified as a major weakness in the current flight training industry. Other than the information they portray, pretty much everything is new: how they work, what drives them, how they share software and display failure modes, and, most significantly, how they actually look. Genesis has completely embraced glass training. 100% of our fleet is glass, incorporating one of the most advanced electronic flight information systems (EFIS) available. Students get exposure to these systems starting on the first flight, and learn deeper functions in each training module. Take your skill to the next level as a flight instructor. Gain extensive knowledge providing in-flight instruction and accelerate your career. Complete your multi-engine instrument rating in our DA42 advanced multi-engine trainer with G1000, weather, GFC700 auto-pilot, and TKS anti-ice.